Sunflower oil is better than other consumption oils and is a healthy option for the body. But little did we know that it can work wonders for our skin and hair quality too. 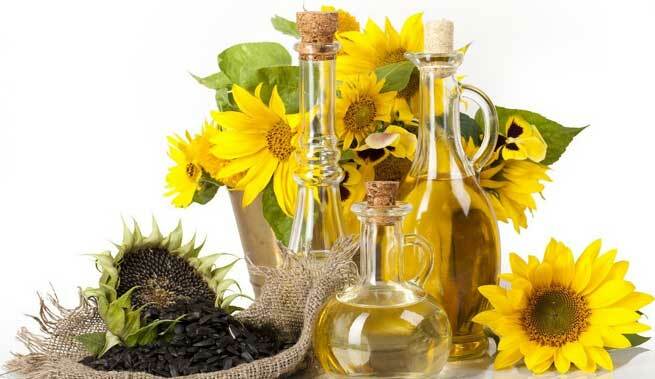 Sunflower oil contains linoleic acid and palmitic acid which makes it a healthy version of consumption oil. Apart from that it is found to be rich in vitamins A, D and E and other healthy nutrients like carotenoids, lecithin and tocopherols. It is not only great to consume sunflower oil, but its application on skin and hairs reap befitting rewards. Following are the ways in which sunflower oil helps your skin. This oil is rich in antioxidants and works as skin moisturizers. It helps in keeping your skin free from acne and other inflammatory skin diseases. Sunflower oil has more amounts of vitamin E as compared to other oils like almond oil and is useful in keeping your young and radiant. It helps in preventing wrinkles and skin loosening as a process of ageing. With its enriching ingredients, it works as a shield on your skin and protects it from various bacteria or chemicals. Apart from this it is light and non-greasy unlike other oils and gets easily absorbed into the skin, helping in cell regeneration and prevents blockage. The harmful ultraviolet rays emanating from the sun damage your skin cell and can cause harmful diseases like skin cancer. Sunflower oil works as a barrier and makes your skin less vulnerable to the scorching heat of sun. Sunflower oil is good not only for normal skin but it is equally beneficial for dry and sensitive skin. It keeps your skin hydrated and also removes any impurities or dead cells. It makes your skin soft, supple and shining. Following are the ways in which sunflower oil helps your hairs. Dry and rough hairs have the tendency of being brittle and causing excessive hair fall. Sunflower oil can help in preventing of breakage by conditioning and moisturising your hairs. Sunflower oil is a great source of linoleic acid which helps in fighting against thinning of hair, hair fall and even baldness of hair. Fatty acids present in sunflower oil along with the rich anti-oxidants, your hairs gain softness and shine. It makes it manageable and removes fizziness from the hairs. It also lends softness and shine to your hairs. Thus, sunflower oil has innumerable benefits for your skin and hairs. Make it a part of your eating habits and also do not hesitate to use it for application purposes. Palak is a voracious reader and passionate writer. She enjoys enlightening herself as well as her readers. She holds a Management degree.